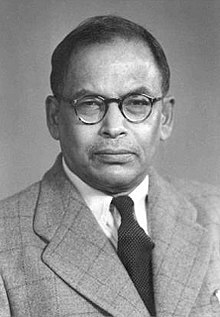 Meghnad Saha FRS (6 October 1893 – 16 February 1956) was an Indian astrophysicist best known for his development of the Saha ionization equation, used to describe chemical and physical conditions in stars. Saha was the first scientist to relate a star's spectrum to its temperature, developing thermal ionization equations that have been foundational in the fields of astrophysics and astrochemistry. He was repeatedly and unsuccessfully nominated for the Nobel Prize in Physics. Saha was also politically active and was elected in to the Parliament of India in 1952. Meghnad Saha was born in 1893 in Shaoratoli, a village near Dhaka, in the former Bengal Presidency of British India (in present-day Bangladesh). Son of Jagannath Saha, Meghnad belonged to a poor family and struggled to rise in life. During his early schooling he was forced to leave Dhaka Collegiate School because he participated in the Swadeshi movement. His Indian School Certificate was earned from Dhaka College. He was also a student at the Presidency College, Kolkata; a professor at Allahabad University from 1923 to 1938, and thereafter a professor and Dean of the Faculty of Science at the University of Calcutta until his death in 1956. He became Fellow of the Royal Society in 1927. He was president of the 21st session of the Indian Science Congress in 1934. Saha died on 16 February 1956 of a cardiac arrest in New Delhi. He was on his way to the office of the Planning Commission in Rashtrapati Bhavan, when he collapsed a few yards away from there. He died on the way, when being taking to a hospital, at 10:15 a.m. (IST). Saha, it was reported, had been suffering from hypertension for ten months prior to his death. His remains were cremated at the Keoratola crematorium in Kolkata the following day. Meghnad Saha's best-known work concerned the thermal ionisation of elements, and it led him to formulate what is known as the Saha equation. This equation is one of the basic tools for interpretation of the spectra of stars in astrophysics, and astrophysicists often use the phrase "to Saha correctly," making Saha one of the few scientists whose name is a verb. By studying the spectra of various stars, one can find their temperature and from that, using Saha's equation, determine the ionisation state of the various elements making up the star. This work was soon extended by Ralph H. Fowler and Edward Arthur Milne. Saha had previously reached the following conclusion on the subject. "It will be admitted from what has gone before that the temperature plays the leading role in determining the nature of the stellar spectrum. Too much importance must not be attached to the figures given, for the theory is only a first attempt for quantitatively estimating the physical processes taking place at high temperature. We have practically no laboratory data to guide us, but the stellar spectra may be regarded as unfolding to us, in an unbroken sequence, the physical processes succeeding each other as the temperature is continually varied from 3000 K to 40,000 K."
Saha also invented an instrument to measure the weight and pressure of solar rays and helped to build several scientific institutions, such as the Physics Department in Allahabad University and the Institute of Nuclear Physics in Calcutta. He founded the journal Science and Culture and was the editor until his death. He was the leading spirit in organizing several scientific societies, such as the National Academy of Science (1930), the Indian Physical Society (1934), Indian Institute of Science (1935). He was the Director at Indian Association for the Cultivation of Science during 1953-1956. A lasting memorial to him is the Saha Institute of Nuclear Physics, founded in 1943 in Kolkata. Saha was also one of the prominent among the works on Halley's Comet. To actively participate in planning of education, industrialization, health, and river valley development Saha "decided to offer himself" as a candidate in the constituency of North-West Calcutta in the 1951 Loksabha election. He ran on the ticket of Union of Socialists and Progressives but Saha always maintained his independence. He was pitted against a very powerful and well funded candidate from Congress, Mr. Prabhu Dayal Himatsingka. Saha was not well funded for his campaign and wrote to his publisher in November 1951 to ask for a Rs 5,000 advance against the sale of his popular textbook Treatise on Heat "because I am standing for election in the house of the people from NW Calcutta". Saha won the contest by more than 16% margin. Saha actively participated in the parliament in the areas of Education, Refugee and Rehabilitation, Atomic Energy, Multipurpose River Projects and Flood Control and long term planning. In the book "Meghnad Saha in Parliament" Saha is described as "Never unduly critical, Saha was so forthright, so incisive, so thorough in pointing out lapses that the treasury bench was constantly on the defensive. This is brought out by the way he was accused of leaving his laboratory and straying into a territory not his own. But the reason why he was slowly drifting towards this public role (he was never a politician in the correct sense of the term) was the gradually widening gulf between his dream and the reality—between his vision of an industrialised India and the Government implementation of the plan." Scientists are often accused of living in the "Ivory Tower" and not troubling their mind with realities and apart from my association with political movements in my juvenile years, I had lived in ivory tower up to 1930. But science and technology are as important for administration now-a-days as law and order. I have gradually glided into politics because I wanted to be of some use to the country in my own humble way. Saha was nominated for the Nobel Prize in Physics for 1930 by Debendra Mohan Bose and Sisir Kumar Mitra. The Nobel Committee evaluated Saha's work. It was seen as a useful application, but not a "discovery." Thus he was not awarded the Prize. Saha was nominated again for the Prize in 1937 and 1940 by Arthur Compton; and in 1939, 1951 and 1955 by Mitra. The Committee held to its previous decision. Bust of Saha at Indian Association for the Cultivation of Science. Statue of Saha, University College of Science, Technology & Agriculture. Bust of Saha in Birla Industrial & Technological Museum. ^ Banerjee, Somaditya (1 August 2016). "Meghnad Saha: Physicist and nationalist". Physics Today. 69 (8): 38–44. Bibcode:2016PhT....69h..38B. doi:10.1063/PT.3.3267. ISSN 0031-9228. ^ "Meghnad N. Saha | Indian astrophysicist". Encyclopædia Britannica. Retrieved 23 November 2016. ^ a b Kean, Sam (2017). "A forgotten star". Distillations. 3 (1): 4–5. Retrieved 22 March 2018. ^ Murty, K. Krishna (2008). 50 timeless scientists. Delhi: Pustak Mahal. pp. 97–100. ISBN 9788122310306. Retrieved 28 July 2017. ^ Bose, D.M. (1967). "Meghnad Saha Memorial Lecture, 1965" (PDF). Proceedings of the Indian National Science Academy. 33A: 111–132. Retrieved 28 July 2017. ^ Wali, Kameshar C. (2009). Satyendra Nath Bose : his life and times. Singapore: World Scientific. p. 462. ISBN 978-9812790712. Retrieved 28 July 2017. ^ Chatterjee, Santimay; Chatterjee, Enakshi (1984). Meghnad Saha, scientist with a vision. National Book Trust, India. p. 5. Even though he later came to be known as an atheist, Saha was well-versed in all religious texts— though his interest in them was purely academic. ^ Robert S. Anderson (2010). Nucleus and Nation: Scientists, International Networks, and Power in India. University of Chicago Press. p. 602. ISBN 9780226019758. a self-described atheist, saha loved swimming in the river and his devout wife loved the sanctity of the spot. swimming and walking were among the few things they could do together. ^ "Nation Mourns Meghnad Saha". The Indian Express. 17 February 1956. pp. 1, 7. ^ "Saha's Remains Cremated". The Indian Express. 18 February 1956. ^ Eminent scientists published by Scholastic India pvt. Ltd.
^ Anderson, Robert S. (2010). Nucleus and Nation Scientists, International Networks, and Power in India. Chicago: University of Chicago Press. ISBN 9780226019772. ^ Anderson, Robert S (1975). Building scientific institutions in India : Saha and Bhabha. Montreal, Quebec: Centre for Developing-Area Studies, McGill University. ISBN 9780888190185. ^ "Members Bioprofile". 164.100.47.194. Retrieved 5 March 2018. ^ "BIOGRAPHICAL SKETCH OF FIRST LOK SABHA(State wise)". www.indiapress.org. Retrieved 5 March 2018. ^ "Members : Lok Sabha". loksabha.nic.in. Retrieved 5 March 2018. ^ "STATISTICAL REPORT ON GENERAL ELECTIONS, 1951 TO THE FIRST LOK SABHA" (PDF). ^ Gupta, Jyotirmoy (1993). Meghnad Saha In Parliament. ^ "Meghnad Saha". Archived from the original on 23 February 2015. Retrieved 31 May 2008. ^ Narlikar, Jayant (2003). The Scientific Edge. Penguin Books. p. 127. ^ Rosseland, S. (1939). Theoretical Astrophysics. Oxford: Oxford University Press. Archived from the original on 23 February 2015. ^ Kothari, D. S. (1970). Biographical Memoirs of Fellows of the National Institute of Sciences of India. 2. New Delhi. Archived from the original on 23 February 2015. Dasgupta, Deepanwita (2015). "Stars, Peripheral Scientists, and Equations: The Case of M. N. Saha". Physics in Perspective. 17 (2): 83–106. Bibcode:2015PhP....17...83D. doi:10.1007/s00016-015-0159-7. Venkataraman, Ganeshan (1995). Saha and His Formula. University Press. ISBN 9788173710179. Wikimedia Commons has media related to Meghnad Saha. "Meghnad Saha". Archived from the original on 23 February 2015. "Meghnad Saha biography". Archived from the original on 27 June 2001. "Chitra Roy pens her reminiscences of Professor Meghnad Saha". Archived from the original on 13 July 2011. "Saha Equation". Archived from the original on 3 May 2006. The Quantum Indians: film on Meghnad Saha, Bose and Raman on YouTube by Raja Choudhury and produced by PSBT and Indian Public Diplomacy. This page was last edited on 15 December 2018, at 18:31 (UTC).